Dalaguete: A role model in responsible tourism development and promotion initiatives. Advance the cultural history and natural heritage identification, preservation and development efforts of the Municipal Government of Dalaguete. 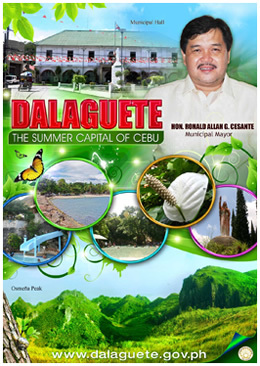 Dalaguete is a first class municipality 84 kilometers southeast from Kilometer Zero of the Cebu Provincial Capitol. 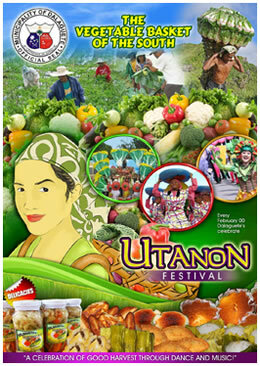 Hailed as the Vegetable Basket of Cebu and its Official Summer Capital (via Cebu Provincial Board Resolution 215-2006 dated January 23, 2006), the town is well-known for its cooler than the usual highlands where about 60 tons of farm fresh vegetables are harvested and delivered on a daily basis to Cebu City and the neighboring towns and provinces. The town’s array of crowd drawer destinations include, among others, the refreshingly cool Obong Spring (where the dalakit tree, reputedly the very tree where Dalaguete got its name still stands), the Mantalongon mountain ranges (home to the unique Rock Formations and the route of choice leading to the famous Osmeña Peak), and the Dalaguete Beach Park(part of the former Argao Beach Club). Indeed, the town is host to some of Cebu’s remaining natural heritage sites – breath-taking mountain ranges with its chilling natural breeze that almost soothes to the bone, enchanting forest patches that are home to some of the world’s most endangered flora and fauna, and coral reefs teeming with diverse marine life. The Mantalongon highlands are increasingly becoming a favorite hideaway of both university students and young professionals alike most specially on weekends and during vacations either to test their raw strength and courage in scaling the heights or simply to escape the monotony and noise of urban life. Recently, there is a significant increase in tourist arrivals of foreigners and locals alike, who look forward to a peaceful countryside life either under the sun, sea and sand or up there at a thousand feet above sea level at the very heart of nature.